Yom Kippur is right around the corner - and tens of thousands of chickens are about to be sacrificed in a highly controversial ritual. "It's a carnival of cruelty," Karen Davis, president of United Poultry Concerns (UPC), told The Dodo. In the practice of kapparot, supplicants swing a live chicken around their heads three times while saying a prayer that translates to: "This is my exchange, this is my substitute, this is my expiation. This chicken shall go to death and I shall proceed to a good, long life and peace." The chicken is then slaughtered and, traditionally, donated to the poor. Not many Jews practice kapparot, and an even smaller portion use a live chicken, as a bag of money is an accepted alternative. But the practice has drawn intense scrutiny both from within the Jewish community and without, particularly in places like Brooklyn and the Bronx where there are a large number of practitioners. "I've actually stood out there on the street with these birds," said Davis, who's witnessed the event in New York for the past several years and will be in the city to protest on Sunday and Monday. "It's just a horror. The birds are starving, they're dehydrated, they get no food ... and practitioners are just grabbing them out of their crates and swinging them and chanting about how they're transferring their sins to the chicken." "And then there's this mass slaughter, illegally, in the streets," she added. Despite the chant, the practice is anything but peaceful for the birds. They start their lives in close confinement at factory farms, then are carted in on packed trucks by the thousands - 50,000 for Manhattan alone, according to Davis. They go without food or water on the journey, and then are dumped onto the sidewalk where they'll spend more days waiting without nourishment or shelter. "They're there now," Davis said. "And they're just sitting there cramped in transport crates. They don't have any food or water. They can't even move." When kapparot begins, participants hold the chickens by folding their wings behind their backs and grabbing on, swinging them rapidly around by their wings - a method that Davis said is absolutely excruciating for the birds. 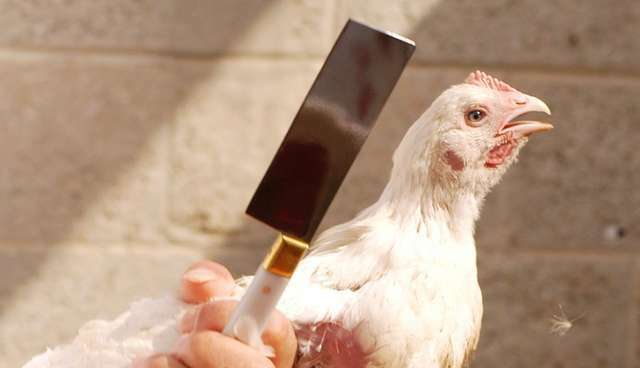 "It's horribly painful, it's potentially injurious to the chicken," Davis said. "I mean you're looking at a bird being hung by their wings, and that alone is one of the cruelest things you can do." 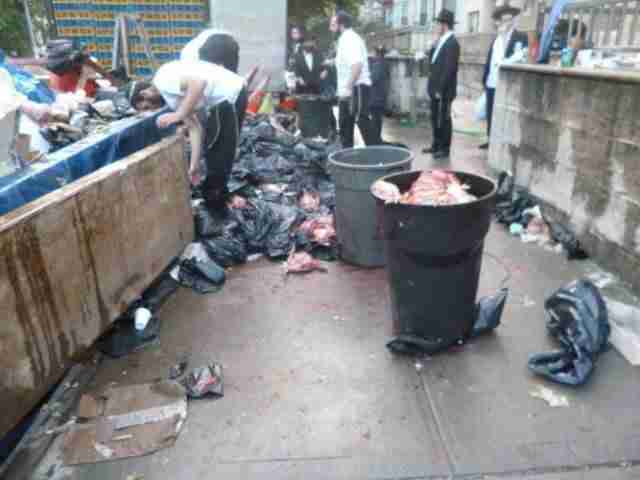 They're then handed off to waiting butchers, who slaughter the animals in front of the crowd - filling the streets with blood and feathers and leaving some Manhattan residents to deal with the grisly scene of animal sacrifice in front of their homes. Jeffrey Cohan, executive director of Jewish Vegetarians of North America (JVNA), told The Dodo that his group prefers to focus on bigger issues such as the factory farming and global consumption of chickens, of which kapparot is a "very tiny piece." But he added that he opposes the practice, which he sees as a violation of Jewish law; the principle of tza'ar ba'alei chayim restricts Jews from causing suffering to animals, he explained. 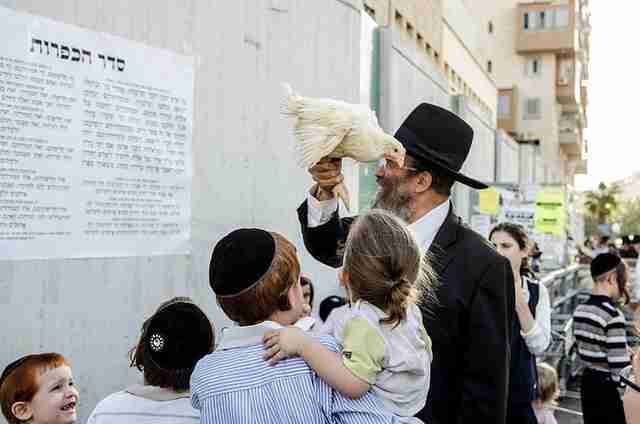 "Using chickens in kapparot blatantly violates these teachings," he said. Cohan added that when kapparot was first established, people were raising chickens in their own backyards and so the animals' suffering would be limited before they were swung about and killed. But today, with the advent of factory farming, the practice is unacceptable. "The ceremony is a legacy from a different era, a past era," he said. 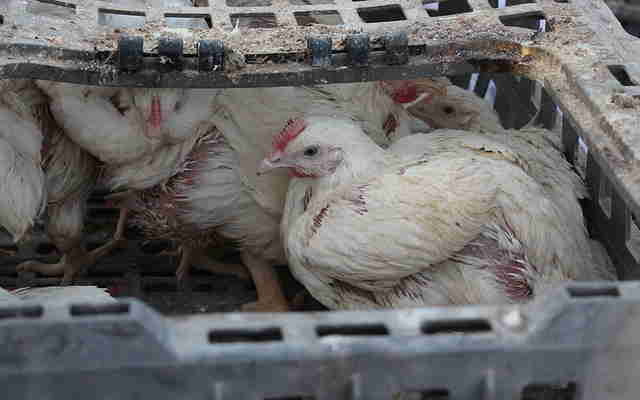 "The chickens were not transported without food and water like they are today. Not that it was ever a good custom, but it's much worse today." He also is concerned that, in many people's eyes, a fringe practice that most Jews reject could come to be associated with the religion as a whole. "It's an embarrassment to our religion that the mainstream media ... loves to take images of kapparot ceremonies," he said. "It's unfortunate because it's not mainstream Judaism, and it's unfortunate that there are any Jews using chicken kapparot." Cohan isn't alone. There are a number of people fighting to end the practice, both from a Jewish and animal welfare perspective. Davis said that UPC has been involved for around 20 years, ever since they started receiving calls from "very disturbed" Brooklyn and Bronx residents who had witnessed the caged, starving animals on their own streets. In 2010 Davis, who is not Jewish herself, founded the Alliance to End Chickens as Kaporos to focus on ending the inhumane practice. "We have the support of the Jewish community," she said. "The Jewish community hates it. The only people who like it are the people who are doing it. Rabbis are increasingly speaking out about it." 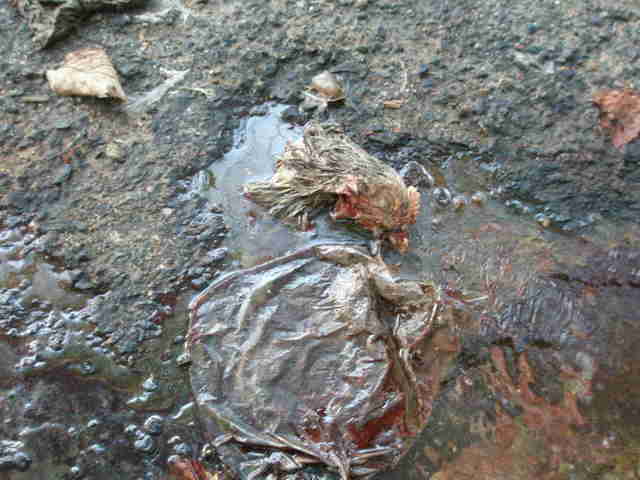 One of their biggest steps came this year, when the Alliance filed a lawsuit in the New York Supreme Court asking for an injunction to be issued against the participants, claiming it was a "public nuisance" that filled the streets with feathers, feces and grisly spectacles. On Monday, a state judge dismissed the case, saying that it was up to city officials to regulate sanitation. "This ruling proves we can't be touched," one Hasidic Jewish man cheered at the time, according to The New York Post. Davis said that she's certain her legal team proved that the practice was a public nuisance, and a health hazard, but that it's difficult to fight against a group that has "political clout" and is protected by ideas of religious liberty. She added that people are reluctant to give it up because there's money to be made by the organizers. Practitioners pay for each bird they swing, and chickens can be sold at a much higher margin than the alternative, a bag of money. It's also hard because people are attached to the custom, even though it's not required under Jewish law, she said. In 2009, Rabbi Shea Hecht, the son of one of the people who was responsible for spreading kapparot in Manhattan, told NPR that he enjoyed the visceral and sacred feeling of holding an animal right before it died. "The main part of the service is handing the chicken to the slaughterer and watching the chicken being slaughtered," he told the outlet. "Because that is where you have an emotional moment, where you say, 'Oops, you know what? That could have been me.'" The Alliance will continue its fight against chickens in kapparot - Davis noted that the group is fine with the practice "as long as it's vegetables or inanimate objects" being swung, and court proceedings will resume at the end of October. But for now, Davis is just focused on this weekend, where she'll be standing out among the dying chickens and trying to make what difference she can. "To stand out on the street, you are hearing crying chickens, you are hearing babies crying," Davis said. "It is mayhem. It is a nightmare. It's like a concentrated look at everything that is wrong with humans' relationship with the living world."